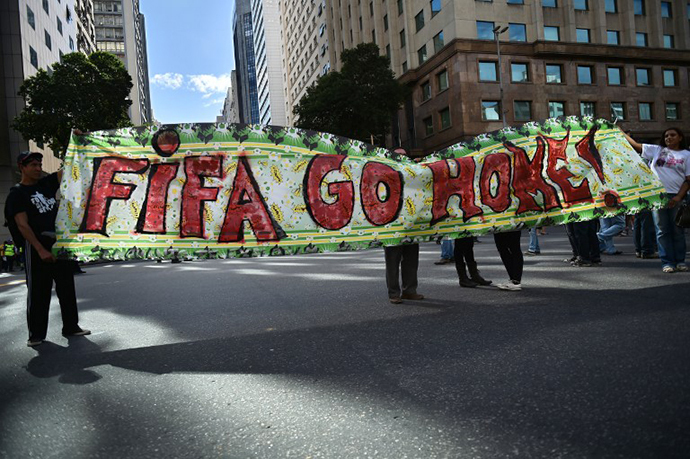 JNN 14 June 2014 Sao Paulo: Brazilian police have used teargas and stun grenades in San Paolo clashing with about 200 protesters angry with the govt overspending on the 2014 FIFA World Cup. This occurred hours before the tournament’s opening game to be held in the city. The Brazilian government has also been criticized for the frequent delays during the construction of the Arena Corinthians stadium that will host the World Cup games. Not only was the $525 million facility delivered six months late, but $150 million was spent over budget. The Thursday opening game will be the first ever to be played in the stadium which is a rude violation of FIFA’s normal protocol for World Cup games. “What I’m seeing more and more is the welcome given to the teams and the happiness of the Brazilian people with our team,” she said in a speech on Wednesday. This entry was posted in America, Europe and tagged Barbara Arvanitidis, Brazil, Football Cup 2014, peaceful protesters, Protest, Protesters, Shasta Darlington, Shata Darlington, World Cup games. Bookmark the permalink.